Powers/Abilities: Melanee is a skilled investigator and has received police training. History: (Namor I#51 (fb)) - At age 15, Melanee went sailing and got knocked overboard. She would have drowned, but Namor saved her and gave her the nickname Minnow. The two kept in contact over the following years. (Namor I#51 (fb) - BTS) - Appointed to assistant district attorney in New Orleans, Melanee was given a large case: to apprehend a serial killer who had struck three times called the King-Cake Killer. The killer was notorious for slitting his victims throats and then stuffing a king-cake in their mouths, and Melanee began gathering facts and forming theories, even being interviewed on TV a few times. Melanee worked with Mr. Peck and had an assistant, Duncan. Her job became more difficult because most of her co-workers wanted credit for solving the case on their own and were unwilling to give appropriate information to Melanee. (Namor I#51) - Melanee read in the paper about Namor's successful saving of an oil rig disaster before turning the page and seeing that the King-Cake Killer had struck again. This time the victim was a personal friend of Melanee's, Janice LaPierre. Saddened, Melanee called cousin, Kurt, to order flowers for the family. Melanee had a brain-storm to watch the bakeries that made king-cakes and gathered the security cameras from her business. After threatening a discrimination suit against Mr. Peck for not telling her about Janice's death, Melanee and Duncan reviewed the facts of the case. Going for a jog, Namor frightened Melanee by pulling her to the side. She recounted how they'd met, and brought Namor back to her apartment where she told him about the King-Cake Killer. She emphasized that she wanted to solve the case on her own. After another victim was found (and Melanee wasn't told about it), she and Duncan spent several hours viewing the surveillance tapes. Melanee was angry when Namor apprehended two juveniles, one named Breeze, at Liz's Pies and Cakes shop. After receiving a tape confirming the killer's motives, Melanee suspected the killer would strike at the Queen of Bons, the leading socialite, on Mardi Gras day. She convinced some cops to join her at the Muse Club, where she went in a safari costume (as everyone dresses up on Mardi Gras day) and watched for the killer. When a float blocked Melanee's view, Namor flew up and stopped the killer from murdering the queen. The killer was apprehended, and Melanee was offered another difficult case, the Lemley case, by Mr. Peck the next day. Melanee saw to it that the King-Cake Killer was presented with the evidence, and the killer made a full confession. 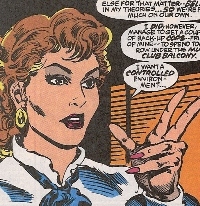 Melanee went out to dinner with Namor before he left New Orleans. Comments: Created by Hollis Bright, Aaron Lopresti, and Ernie Chan. Melanee's hair kept changing color in this issue, from blonde to orange to brown. On page 31, her hair has three different colors. Maybe she's a mutant? King Cakes are quite tasty. Have one sometime, but don't swallow the baby! (Namor I#51) - Cousin of Melanee Carondelet, Kurt was called by Melanee so she could order lilies for the family of Janice LaPierre, the latest of the King-Cake Killer's victims. He tried to ask her questions about the case, but she was unwilling to talk about it. (Namor I#51) - After the King-Cake Killer struck again, Mr. Peck did not inform Melanee, the assigned investigator on the case, leaving it for her to find out from the newspaper. A furious Melanee confronted him and threatened him with a discrimination suit. After Melanee successfully apprehended the killer, Mr. Peck offered her the Lemley case. (Namor I#51) - Acting as an aide to Melanee Carondelet, Duncan asked her questions about king cakes and the King-Cake Killer. When Melanee went for a jog, he cautioned her to be careful. Duncan later viewed surveillance tapes with Melanee, and was with her when she finally identified the killer. He heard Melanee's plans to apprehend the killer, and felt embarrassed after getting jovial with Namor, Melanee's ally. Melanee and Namor later stopped the killer. 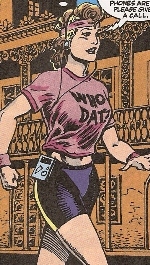 (Namor I#51) - A local radio host in New Orleans, Skip Bean hosted his show on KNOK. He took calls from the public to discuss the King-Cake Killer. One such caller, Rhonda, said the police were wasting tax-payer money. Skip related some facts and implored ladies to stay off the streets. (Namor I#51) - Breeze and his ally held up Liz's Pies and Cakes shop and grew angry when only $55 were in the till. Breeze tied Liz's hands and put a gag on her mouth, prepared to receive compensation in another way when Namor burst through the door and threw Breeze and his ally against the wall. After untying Liz and making sure she was okay, Namor flew the two villains away, dropping then catching Breeze, and dropped them off at Melanee Carondelet's office for arrest.